My earliest textile memory was standing on the kitchen table as a three year old while my mother turned up the hem of a coat she was making for me (from a pattern she had drafted herself). I loved the coat but hated the matching bonnet, especially the chin strap. A Noah's ark made by my father was one of many handmade toys I treasured. I guess making things was in the blood! I first became interested in braiding in the early 80's when I was introduced to Inkle weaving at the Ulster Folk and Transport Museum. After attending a Summer School on Kumihimo in 1987 & 1989 I was hooked and set up my own business "Arabesque Braids" in 1990. I initially made Kumihimo jewellery and light pulls but since 1994 I have focused on developing kits to involve others of all ages in a variety of braid and cord making. In 1997 I was a founder member of "Braidmakers Workshop" dedicated to demonstrating and teaching, backed up by a wide variety of kits. 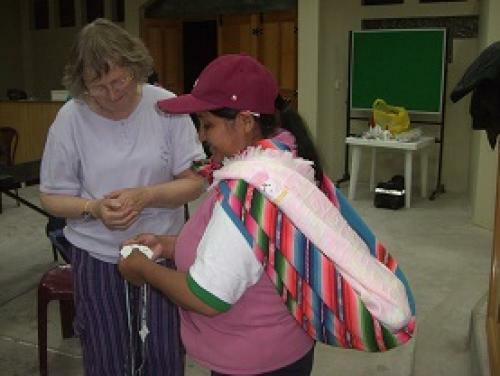 In the picture I am teaching an Indian woman in Peru to do Fill the gap - and yes, it's a baby on her back. Did you do French Knitting as a child? What did you do with it? I enjoyed doing it but making things with the result was not inspiring. I was challenged by the group to do something with it and so developed a range of attractive beaded necklaces. In November 2006 I wrote an article in Peoples Friend showing how to make the necklaces and this engendered an enthusiastic response. Booklet - "Beyond the Round"
Booklet "Fancy Nancy - Dolls and Decorations".